The Championship relegation battle is as tight as ever at this stage of the season, and any three from eight or ten clubs could find themselves in League One by next summer. Now that the table has taken shape and we’re around the halfway point of the season, it’s a good time to look for a little bit of value in the relegation markets, and we fancy two Yorkshire sides to have a long hard slog ahead of them. 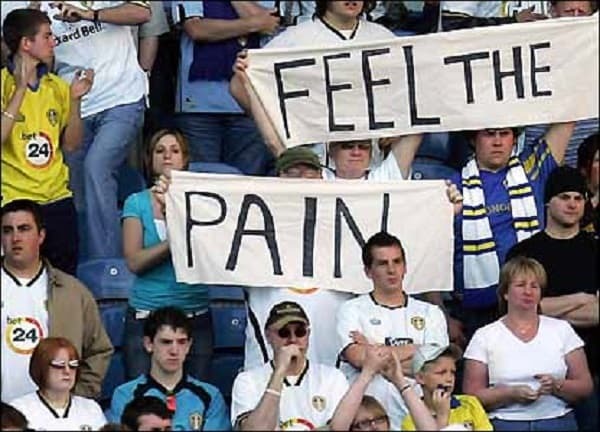 Leeds can only be described as a crisis club over the last few years, and it must be difficult to take for the fans who saw their team in a Champion’s League semi-final as recently as 2001. The drama shows no sign of stopping and in December the club’s owner Massimo Cellino was disqualified from the league for failing the ‘fit and proper’ person test due to allegations of tax evasion in Italy. Cellino is set to appeal against the disqualification, but regardless of the outcome he will be entitled to take control of the club again in March as his conviction will be deemed spent. Either way it does nothing to bring stability to a club which has lurched from one problem to another for several years. Despite suggestions from supporters that Cellino has brought some stability to the club, he’s done little to reflect that in his choice of managers. Brian McDermott left the club in May and was replaced by former Forest Green boss, Dave Hockaday. He was in charge for just six games before being replaced by Slovenian coach Darko Milanic, who was also given six matches before being shown the door. Current boss Neil Redfearn has been promoted from the youth set-up, and at least he knows the club well. Unfortunately he won’t be able to bolster his squad in the January transfer window, as Leeds were put under a transfer embargo, along with Blackburn and Nottingham Forest, for not adhering to financial fair play rules. They will have the opportunity to have the embargo removed in June next year, but by then it may be too late. Leeds are just a single point above the relegation zone, and have won only 6 of their 23 games this season. They don’t have the strength in depth and will be relying on youth players to an extent to help them through the season. They have been teetering on the brink of disaster for a long time now, and it would be sad but no surprise to see them go the way of Portsmouth. Rotherham were promoted last season and took to the league well with a couple of victories early on, but they’ve now only won 3 in 20 matches, and that’s not far from relegation form. They’re hard to beat, and have only lost 8 of their 24 league games, but they’ve drawn 11 and have just 5 wins to their name. They currently sit in 19th position just three points above the drop zone, and a lack of quality could well be their undoing at this level. They were held to a draw by bottom club Blackpool at the weekend, despite dominating the game, and a lack of goals is a problem. They’re the third lowest scorers in the entire league, and that’s a worrying statistic for manager Steve Evans. At the prices, Rotherham look good value for the drop come May 2015. Blackpool are far and away the worst side in the division this season, and they look to have the first of the three relegation places sewn up. The bookies are certainly taking no chances on a team that has managed just two wins all season. They have amassed only 14 points, and are already nine points adrift of safety. Millwall are in the bottom three on goal difference at the moment, and it looks like being a long hard season for manager Ian Holloway and his troops. They’ve won just once in ten matches and are one of five teams to have already conceded 40 league goals or more this season. They’re definite contenders for the drop but Rotherham are a much better price considering they’re only three points ahead of the Lions. Holloway is renowned for his blood and thunder football and that will be the sort of resolve that Millwall will need to battle through the season. They can be expected to be right in the mix by the time we get to the last few games of the league campaign. Wigan were tipped by many to be challenging at the other end of the table this season, but they’re deeply rooted in the bottom three with just 20 points. Chairman Dave Whelan attempted to halt their slide when he dispensed with the services of Uwe Rosler, but caused controversy when he appointed disgraced former Cardiff boss, Malky Mackay. However, despite his off-field issues, Mackay has proven himself to be an astute manager, especially at this level when he led Cardiff to promotion before it all went pear-shaped. He grabbed his first win as Wigan boss on Boxing Day with the triumph over Leeds, and will surely do enough to take Wigan up the table quickly over the next few months. It’s the position of Brighton and Wigan in the lower reaches of the table which is skewing the market somewhat, and is giving us value on the other teams. Both clubs have good enough squads to pull away from trouble, and like Wigan, Brighton will be hoping a change in manager will bring about a change in fortunes. Sami Hyppia resigned late in December after a poor run of results, and the club have picked up four points in two games already under caretaker manager Nathan Jones. They have 23 points at the moment and are only out of the drop zone on goal difference, but it’s surely a matter of time before they also pull away from the foot of the table.